Emmy's best friend was kidnapped ten years ago. Life in her small town home has been stilted since Oliver was taken by his father. Her parents are the most over-protective parents in town and she keeps so many secrets from them it's hard to keep count. Then Oliver comes back. After ten years, Oliver finally learns that his father was the bad guy. It wasn't his mother who deserted him, it wasn't a messy separation that led to him never seeing her again. He needs time to figure out his new world. He's back in a place he doesn't remember calling home and his life has changed drastically. 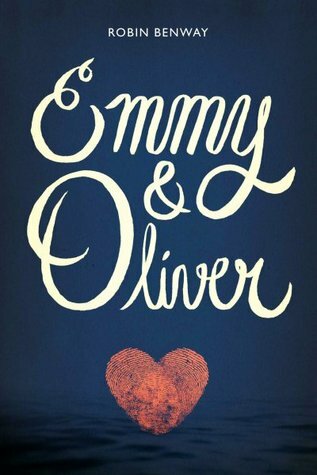 In the second grade, Emmy and Oliver pledged to be best friends forever. Has their relationship withstood the test of time and distance? Can they mend their friendship and build it into something greater? Emmy has held onto him for a decade. Has Oliver held onto her? I loved Robin Benway's "Far From The Tree" so much that I just had to find another book by her. While searching, I discovered this cute story on Goodreads and I knew it was the perfect book for my summer travels. I don't usually associate the word "cute" with a book, but it seems like the only word for this one. None of the characters are startlingly unique, nor are the smaller plot details particularly surprising. The story has its emotional twists and turns, but at the end of the day, it was... cute! Apart from the background romance story line, Benway explores some more "coming-of-age" themes as well. She writes about the typical teenage sneaking around but the premise is quite different. Emmy not only hides her wild side from her parents, but also her talent and passion for surfing. Meanwhile, Oliver is struggling to adjust to his new family and feels suffocated by everyone's scrutiny. With so many complex issues, I was surprised at how quickly the story progressed. The writing flowed so smoothly that at times I didn't even realize we were moving from one issue to the next and I mean this in the best way possible. Benway did a great job of highlighting all the emotions, just as she did in "Far from the Tree". Her style stood out clearly and I was quite pleased with my choice for the beginning of summer. If you haven't read Benway yet, I'd encourage you to pick this one up! The synopsis may sound cliched, but the story delves much deeper into the characters' lives than one may imagine. It was a quick read for me, so I'm sure you can make time for this YA Contemporary novel! It's not a book for anyone who doesn't normally read YA, but if this is your genre- this book will definitely be a fast favorite. Oooh...this sounds good! An intriguing plot. Glad you enjoyed it - thanks for sharing! You should really pick it up when you feel like taking a break from plot-heavy books!